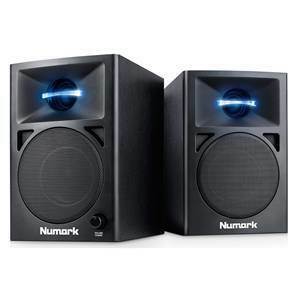 Designed to offer the bedroom DJ audio playback in a compact format, the pair of Numark N-Wave 360 Powered Desktop DJ Monitors includes two matched speaker cabinets. 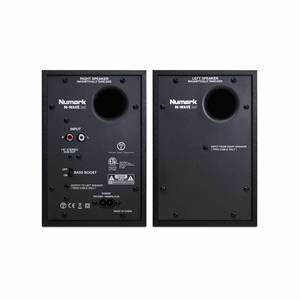 Designed to offer the bedroom DJ audio playback in a compact format, the pair of Numark N-Wave 360 Powered Desktop DJ Monitors includes two matched speaker cabinets. Each cabinet contains a 1" silk dome tweeter with blue LED illumination matched with a 3" woofer via a crossover circuit. The onboard amplification system can deliver up to 60W of peak power. These magnetically shielded powered monitors can be used in a compact setup as they won't interfere with other electronics and offer extra protection when used near a video monitor. The amplification system for both speakers is mounted in one unit, so only one speaker needs a power connection. Connect the second cabinet using the plug-in speaker cable (included.) The volume knob is located on the front panel for easy access. High-density materials are used to increase efficiency, and bass porting improves the low-end response. Concave oval waveguides provide a wide listening area "sweet-spot" for accurate imaging and fatigue-free listening. Radial-edge speaker baffles minimize audio distortion.